Out of stock and now retired. Roomy in size and elegant in appearance, the Soft Wallet in deep red is the must-have addition to every woman’s Miche Bag. With two zippered compartments, individual card storage and more, it can hold virtually all of your shopping essentials. 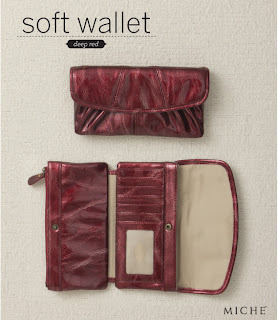 Luxurious textured faux leather and convenient magnetic closure.